Welcome to the second stop on the Pickle Toes Patterns "Back to School" blog tour!! I'm excited to share with you PTP's Adorabelle pattern! 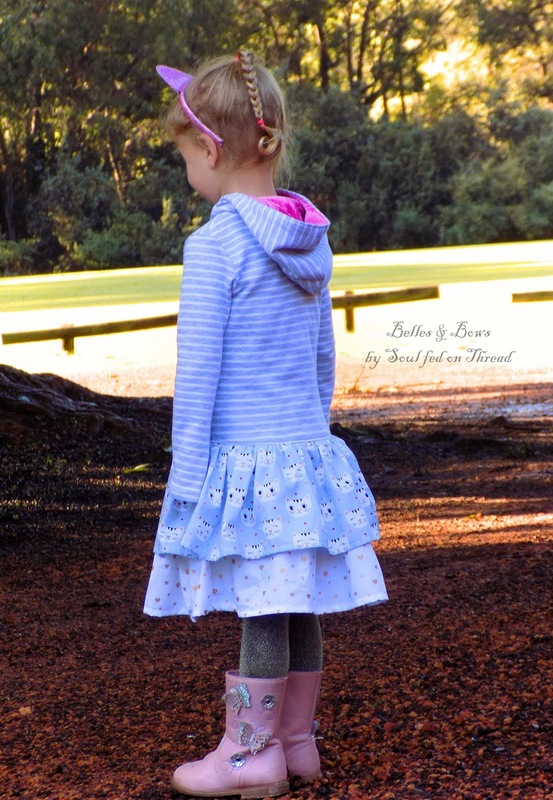 While in Australia we must send our children to school in uniform - even in the public school system, this little number is great for wear all year round! 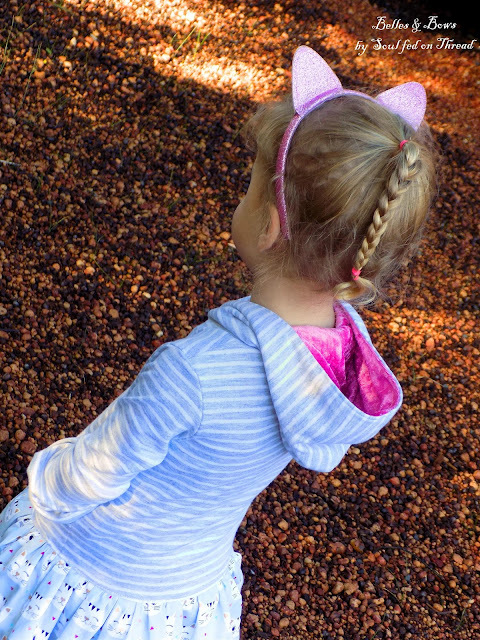 So, if your child is a uniform wearing one, Adorabelle is perfect for after school or weekends instead! This PDF pattern includes sizes 12 months to 16 girls. 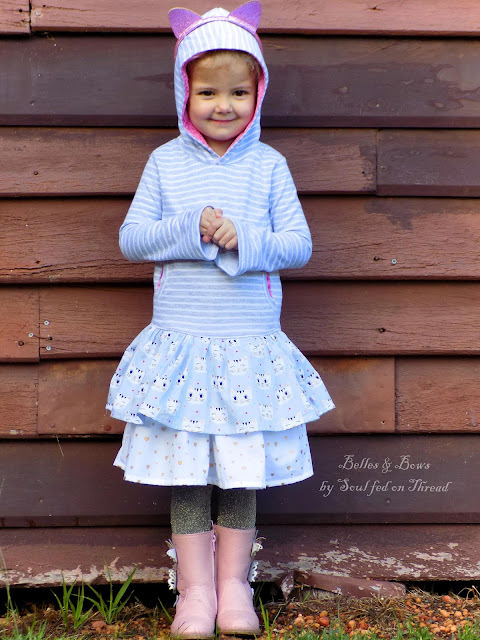 Adorabelle is a versatile pattern designed for knit fabrics - so some experience sewing with knits is beneficial when attempting this sew. 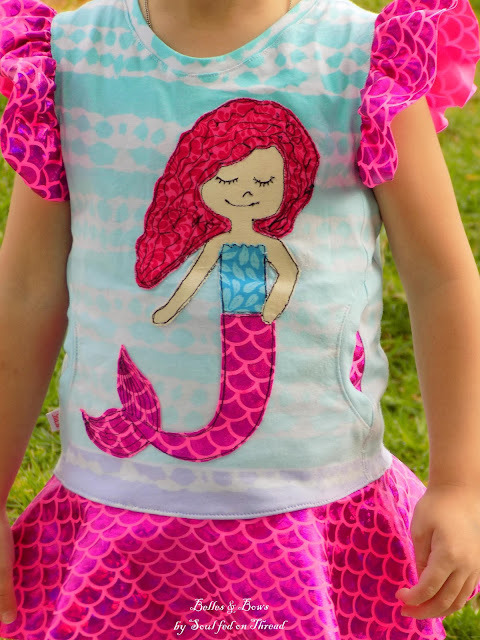 No one technique required to sew Adorabelle is difficult, however I'd recommend for sewers of at least confident beginner level. 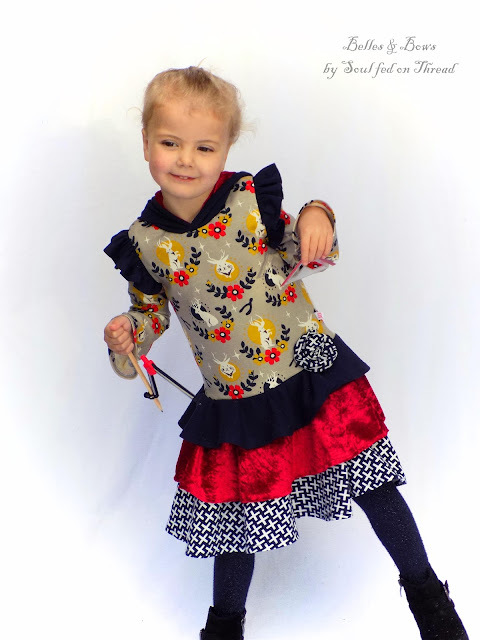 Adorabelle comes with a range of sleeve options - sleeveless, flutter, short & long bell sleeve. 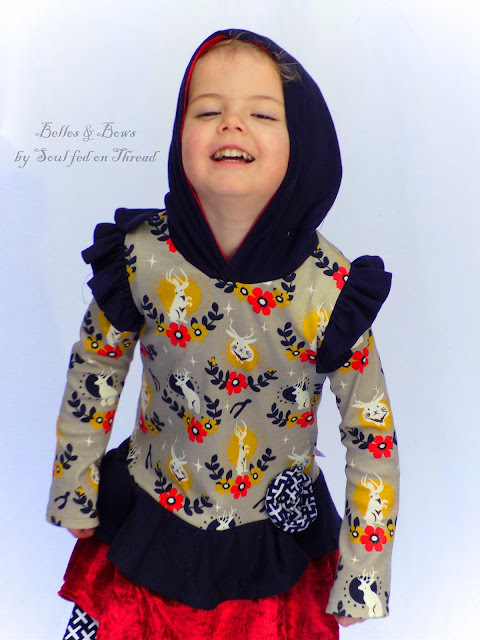 You can also opt to add the flutters to the short and long bell sleeves to create even more looks! I love that this pattern can be made to create so many looks, it represents real value, a pattern that can be visited again and again. 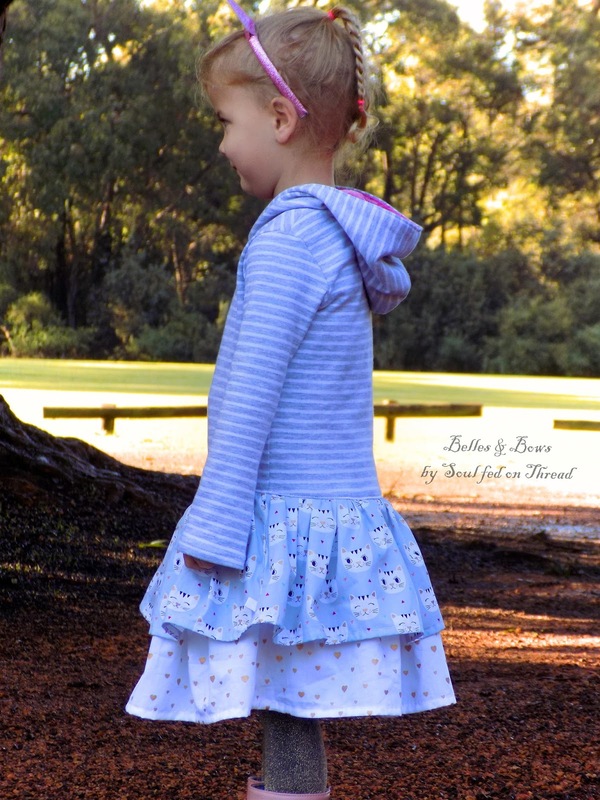 Adorabelle has three circle skirt options. Triple layer, double layer & single. You could opt to create a peplum style top with the shortest single layer or even a simple dress, using only the longest skirt option! Your imagination is the only thing limiting you! Layer as you will! Or not at all!!! 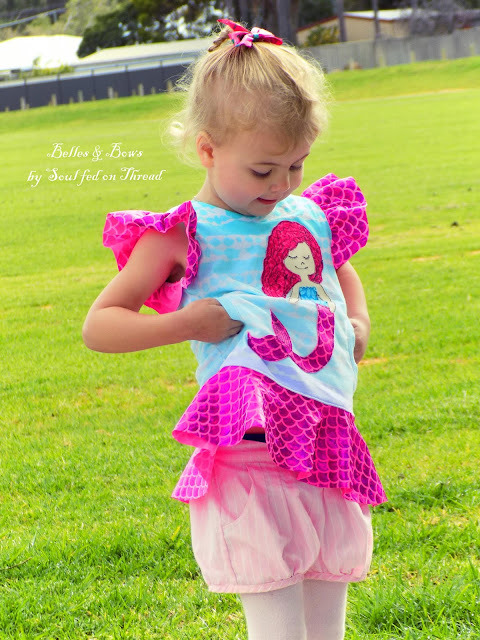 Leave off the skirts, add seam allowance, hem and you have yourself a beautiful top! But WAIT! There's more! 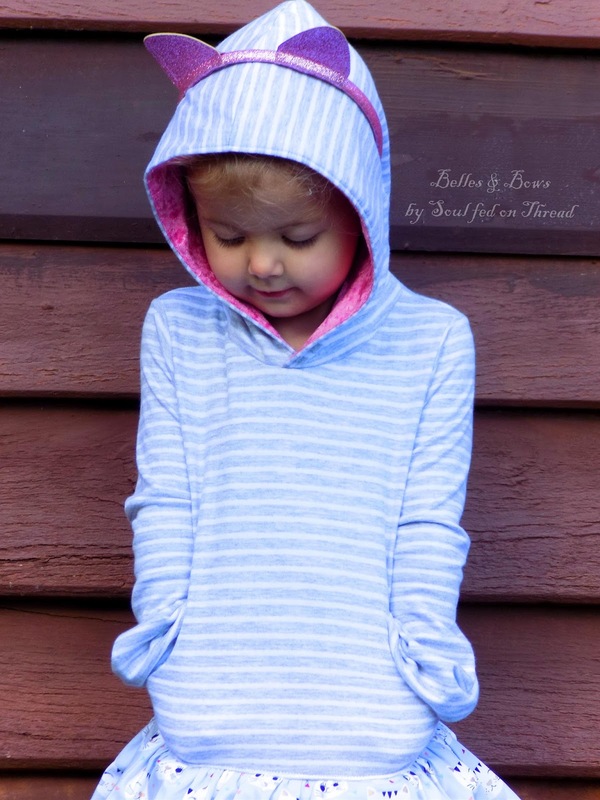 Not only do you have all those skirt and sleeve options, but there are two hood options!! Or go for the simple neckband. 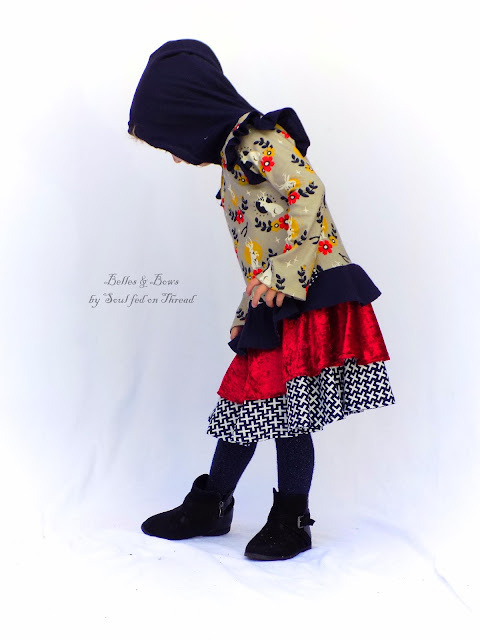 Instructions are given for lined or unlined hoods. I opted for lined hoods as I personally prefer the finish. This dress has the (what I like to call) "peasant style" hood. I've never come across a pattern with a hood quite like this and I found it so totally FUN! It's curly & whirly, full of whimsy and everything that sets an imagination run wild! Plus, my daughter thought it was very fun too! So a real winner! Now, I'm not done with explaining options! So just hold up a little longer! 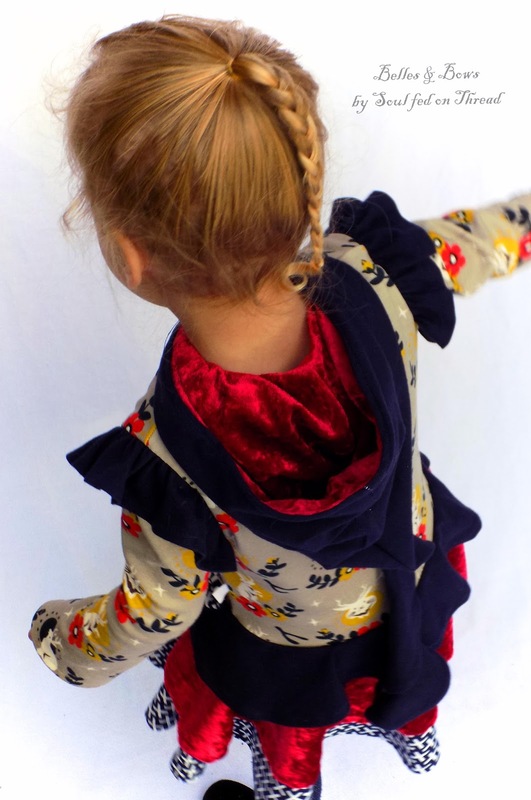 You may have noticed on my dress I have added a little rosette? This is a dash of my own flare, however I'm very pleased to share with you exactly how I made it! Press your fabric, wrong sides facing (one long side will be the fold.) Mitre your short ends of the fabric (this means cut a 45 degree angle), the tip or point will be towards the folded edge. Next, set your sewing machine up to sew a basting stitch (longest stitch option with the loosest tension.) Sew one or two rows of basting stitches along your long raw edge - starting and ending at the tips of your mitred corners. 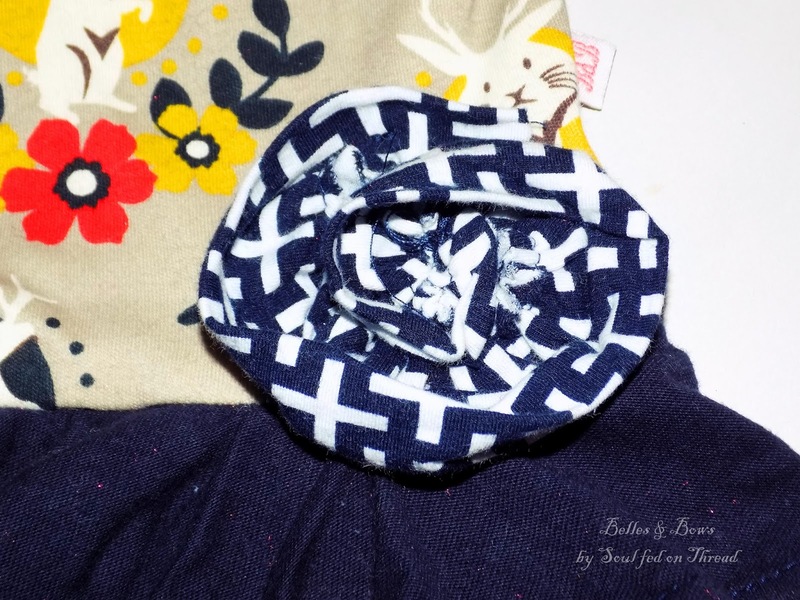 Gently gather your fabric strip & curl into a "rose shape" (like a spiral.) Tack your rose to hold it in the desired shape. 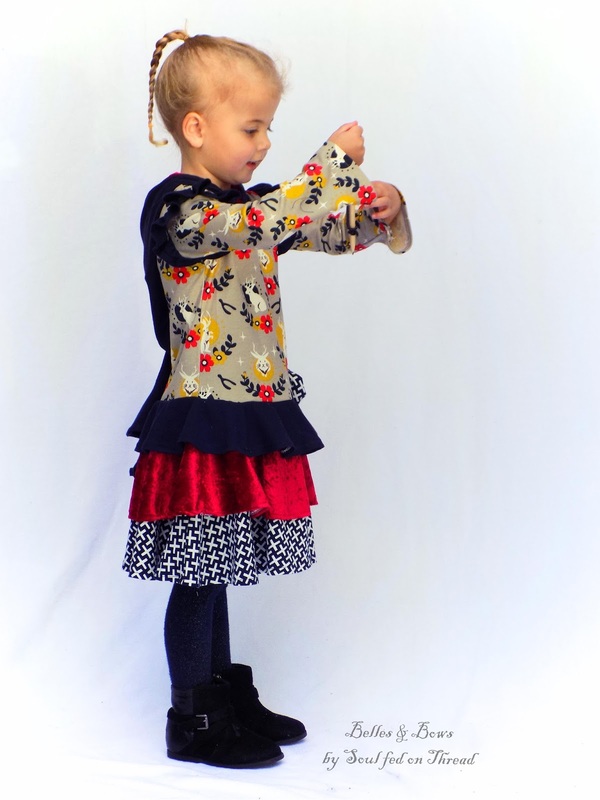 Next hand or machine sew your rosette onto your dress! 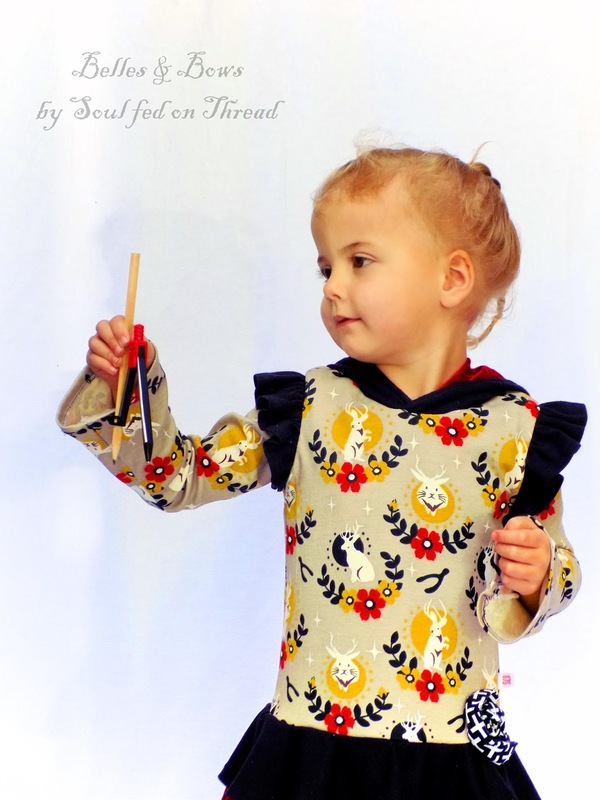 There is no need to finish edges as knit fabric doesn't fray! Too easy!! "Come to the dark side!" The Adorabelle circle skirt has fantastic twirl!! I added a luxe factor to my dress by adding panne velvet which also has a good stretch factor so suited this dress nicely! 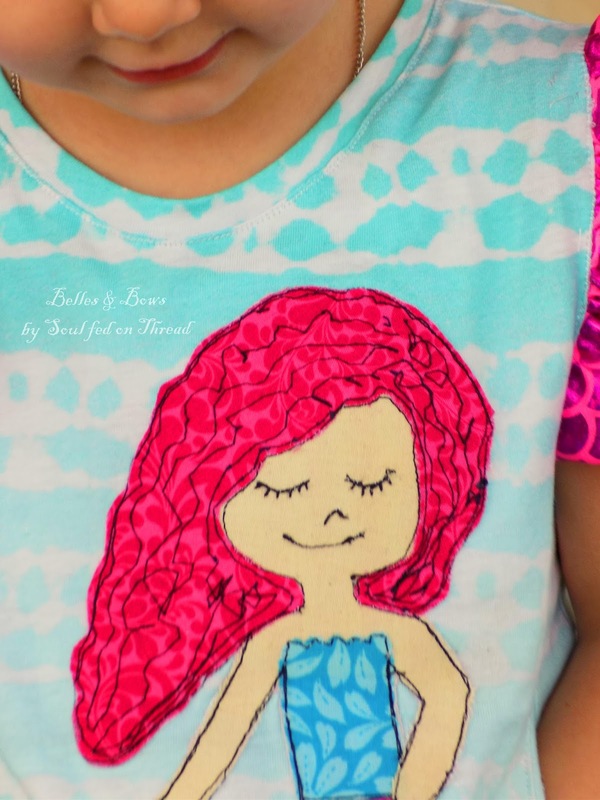 My daughter absolutely loves this dress and I enjoyed the sew immensely! Please keep reading to see my two other versions of Adorabelle. 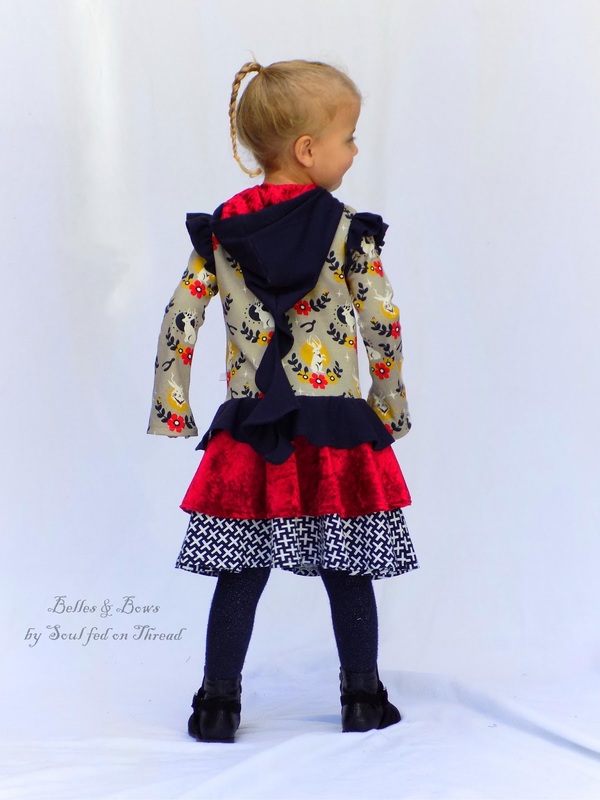 This version of Adorabelle has the simple hood (lined again), long bell sleeves, front pocket and double layered skirts. 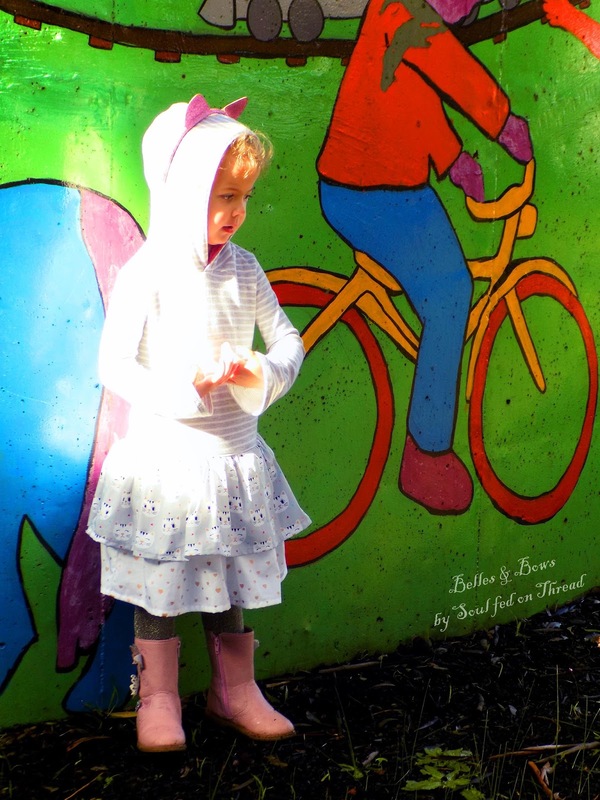 My daughter is slender and requires a blend of sizes, (2 width and 4 height.) 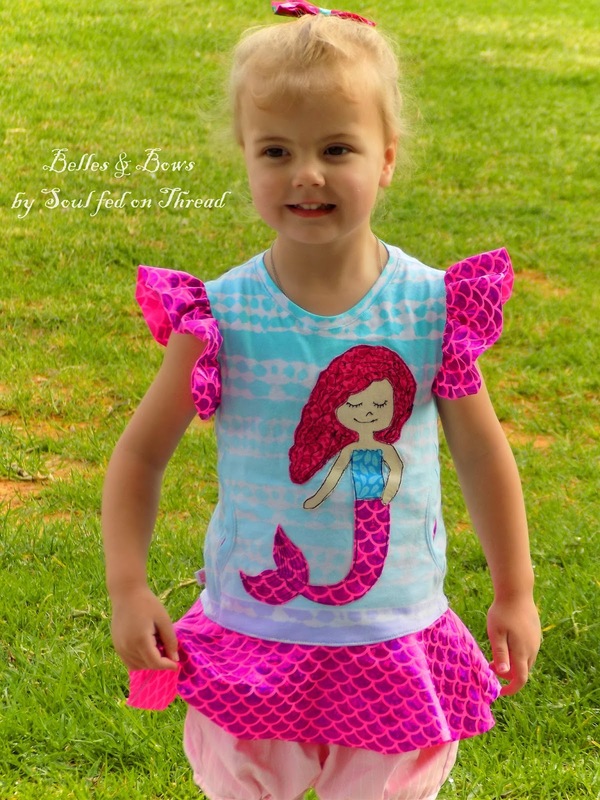 The Adorabelle pattern has layered pattern pieces, which makes sewing a blended size a breeze! 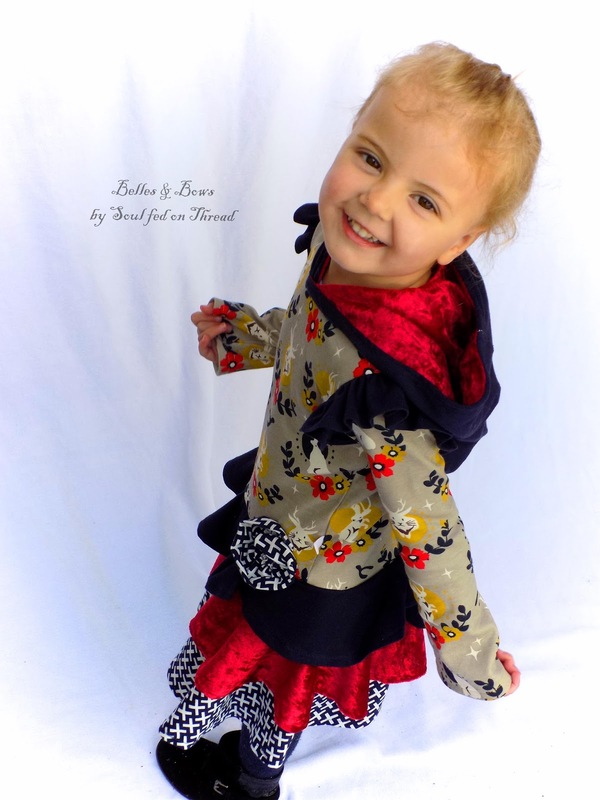 The double skirts on this version have been sewn in woven fabric! A hack to the original pattern that I will now explain! I opted to only have two layers on this dress - the longest & second longest skirt. 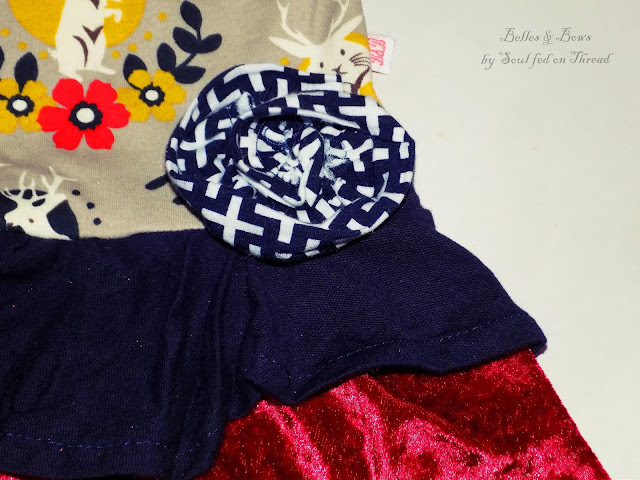 Rather than cutting circle skirts as per the pattern I cut rectangular skirt pieces and gathered them. So one will need to print the skirt layer pieces you wish to emulate. Measure the height of the skirt on the fold line and add for a seam allowance if required - woven fabrics need hemming! For each size larger than 2, add an inch to your length. For example, for size 3 width, cut two pieces at 31" long, for size 4, cut 2 pieces at 32" long etc. Or for the smaller sizes, reduce by an inch for each size smaller. Once you have your rectangle skirt pieces cut, sew the short edges (with right sides facing), finish the raw edge - serge or zig zag. Hem the bottom long edge of your skirt pieces - I like to fold 1/2" then another 1/2". Run two rows of basting stitches along the top of each skirt piece. Gather to fit the top of your Adorabelle. 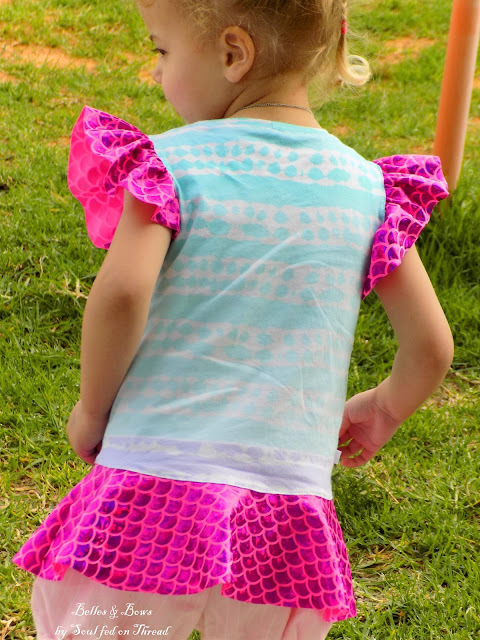 If you have more than one layer on your skirt, baste your layers together before stitching to your top. Sew your skirt to your top, make sure you finish your seam as woven fabric will fray! 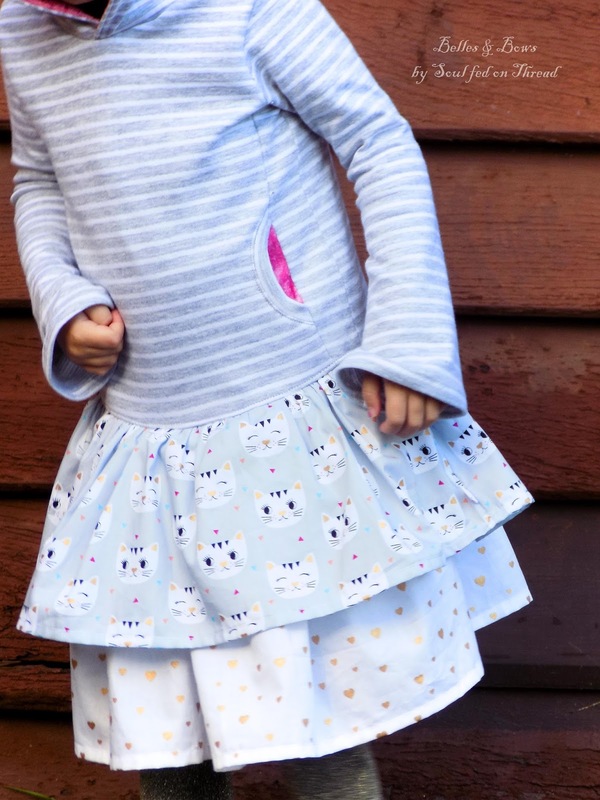 Add elastic as directed in the original pattern - heavy skirts can stretch and distort your top without some stabilization. Press seam towards the top, top stitch using a stretch stitch. Now your dress is ready to wear! If you've just scrolled past the hack, you will now notice that this skirt is woven! Not a difficult modification to make to the Adorabelle. Made with soft cotton jersey, the top of this dress is lovely to wear! 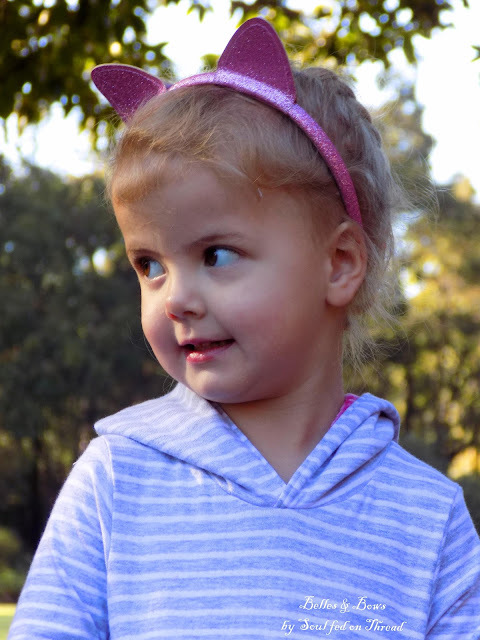 The pocket option on Adorabelle is clever indeed. Not two side pockets, but one adjoining pocket!! Perfect for warming hands or storing snacks/treasures! 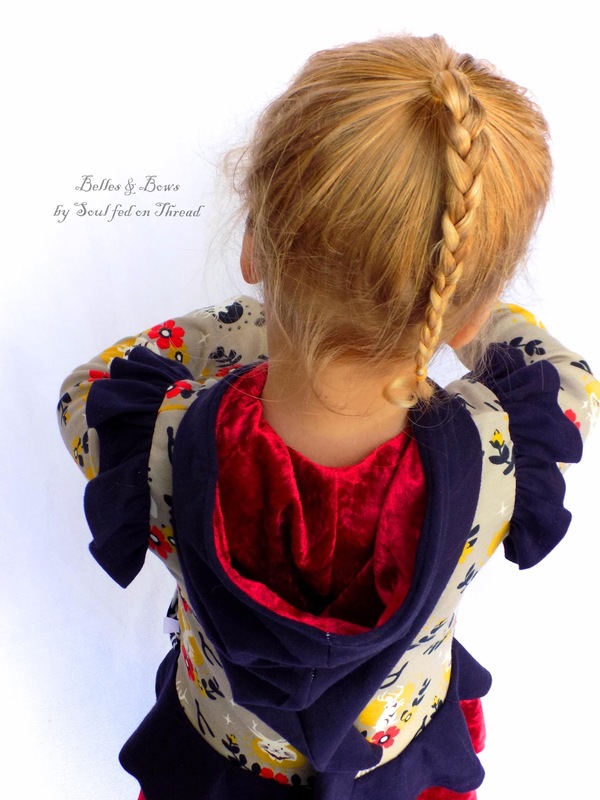 I added a pop of colour to this dress by using pink velvet to line to pocket and hood! My little Miss loves cats! 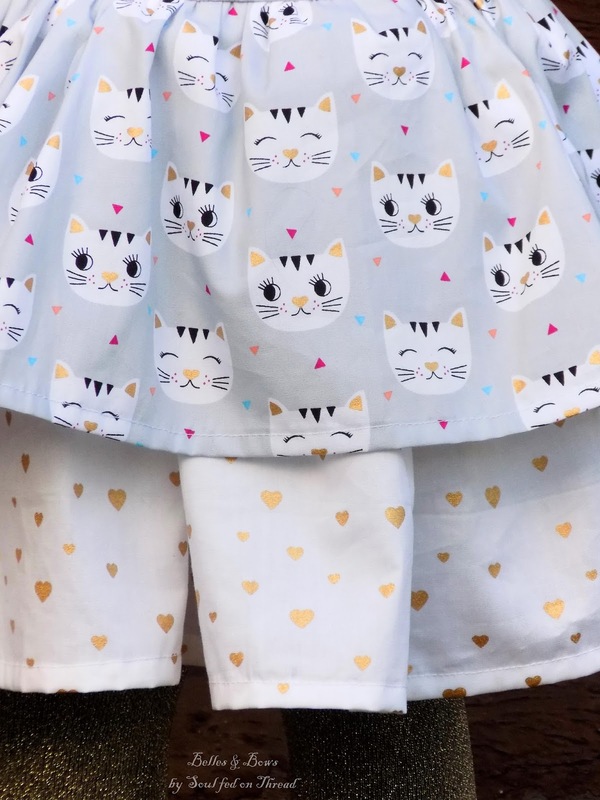 So I'm always on the look out for fabulous cat fabrics! 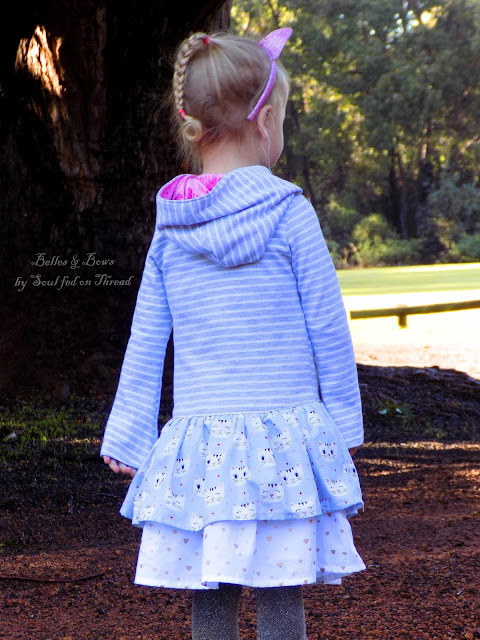 Cotton poplins also make for a beautiful gathered skirt. Now dear reader, I'll just let you scroll! 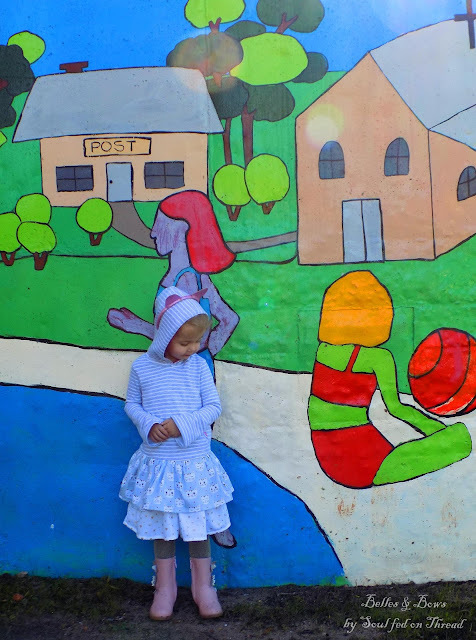 Photos are my favourite part of blogs and I hope you'll enjoy mine! But make sure you get all the way to the end, there's a nice little surprise down there! Adorabelle, let there be warmth! Its true, in my part of the world it is chilly! (Clearly our winters aren't as cold as some!) 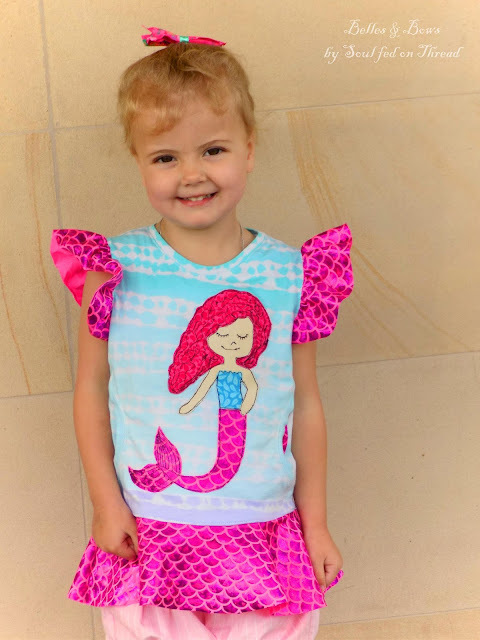 However, my little trooper braved the weather so we could show you a very summery version of Adorabelle, because this pattern truly is versatile! 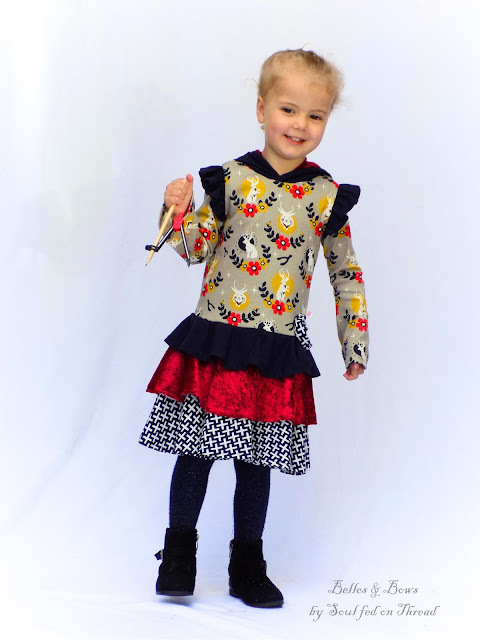 This is the peplum top skirt length and paired with bubble shorts or leggings, it truly is it's namesake! Adorable! I used cotton jersey for the main shirt and then paired with lycra for a fun beach look! Keep a small (or large) stash of chocolate near by.......for those times when you might feel like hitting your machine for being naughty! Reach for the chocolate! The chocolate I said!! Molly Mermaid made for the perfect feature on the front! 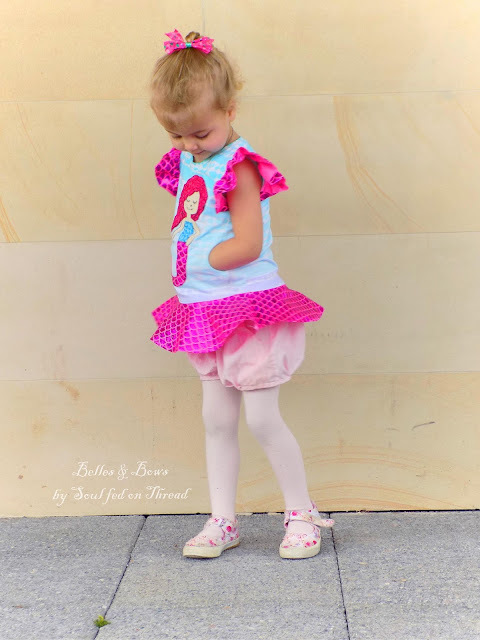 If you have a special panel you've been looking to use, then Adorabelle is the pattern! Or, like me, add some FMA or embroidery. 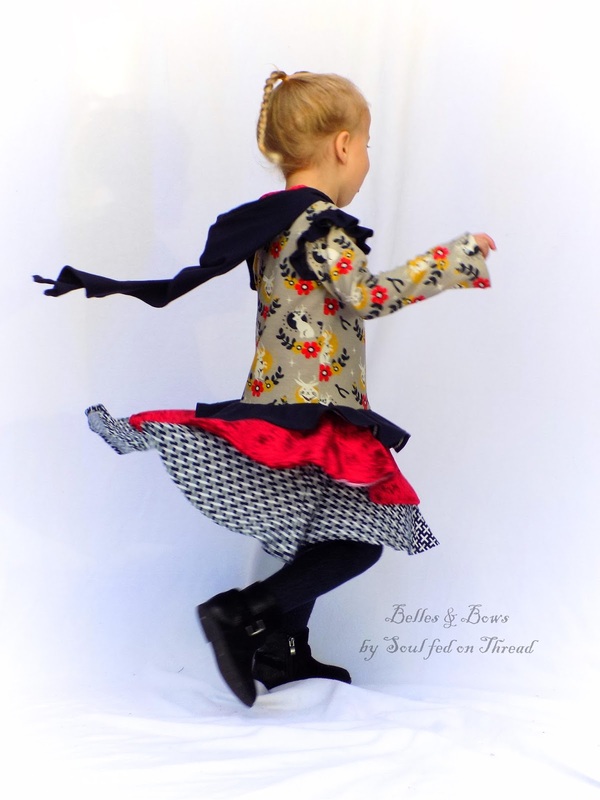 Even the peplum skirt has great twirl! Well done dear reader! You have made it to the end!! It has been an epic post! 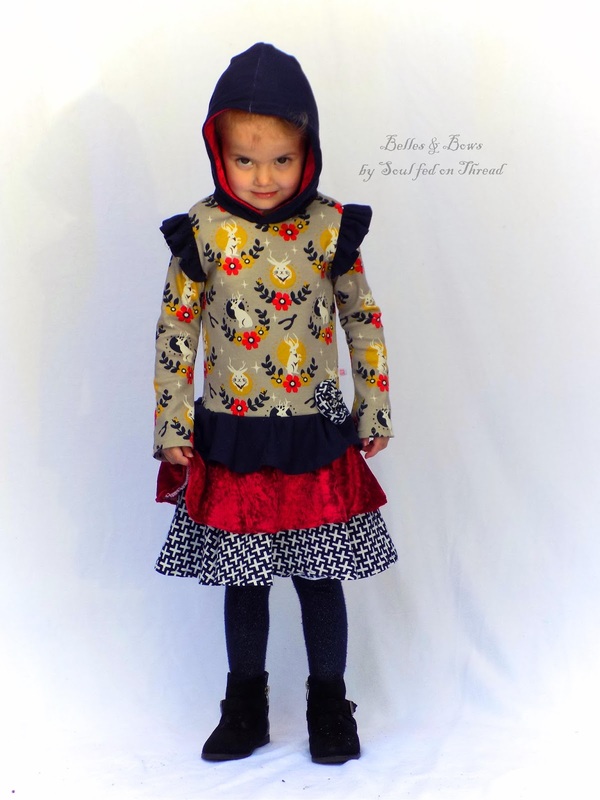 But I couldn't share all the delights of Adorabelle in just one sew. I promise you'll feel the same! Now for the best bit! You can get your own copy of Adorabelle at a discounted rate! 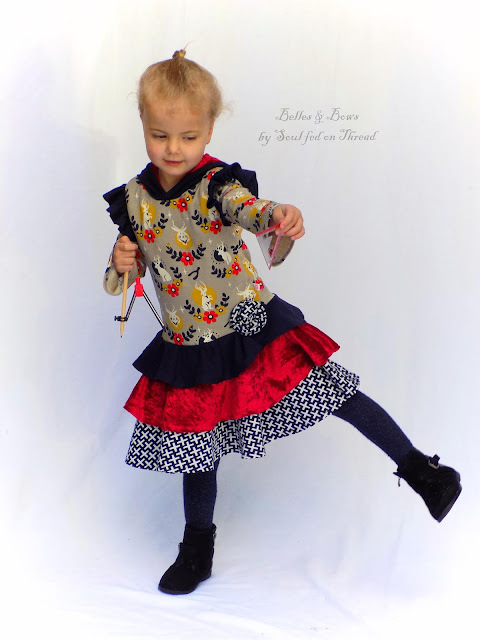 25% off with coupon code "ADORE"
I'd love to see what YOU do with Adorabelle! 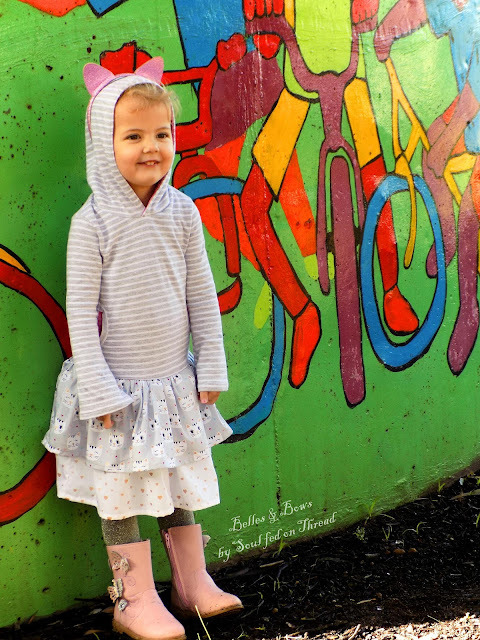 Make sure you join the Facebook pattern group, share your creations, find inspiration and get all the latest Pickle Toes Patterns news! 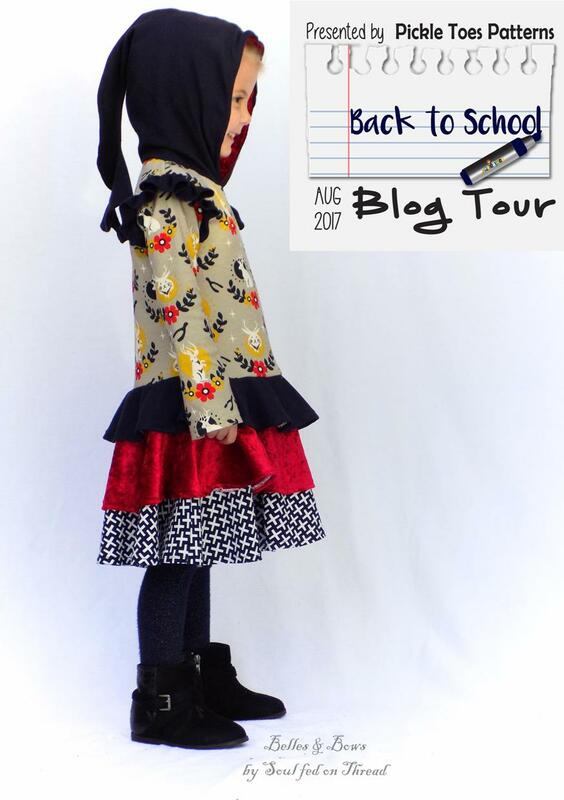 Thank you Kellie for providing me with the Adorabelle pattern and having me along for the Pickle Toes Patterns "Back to School" blog tour! 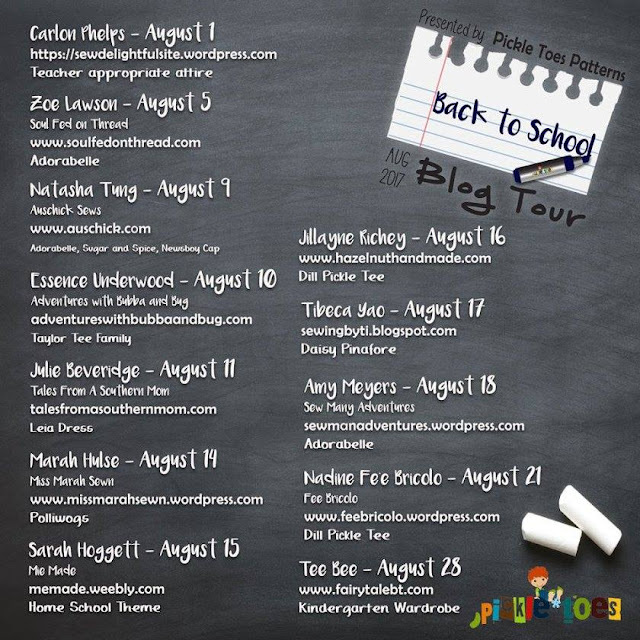 It has been so much fun and I look forward to visiting all the blog stops! Time for this bus to get going! See below for the full tour schedule. Happy sewing! See you next time!